I brought a nice venison haunch back from my Girl Hunter Weekend in Arkansas. Ain’t it a beauty? You should make it too, it’s amazing. And if you don’t have venison you can also use lamb, beef or bison and it will be delicious. Just be sure to use a tougher cut so that the collagen breaks down and becomes buttery in the stew. 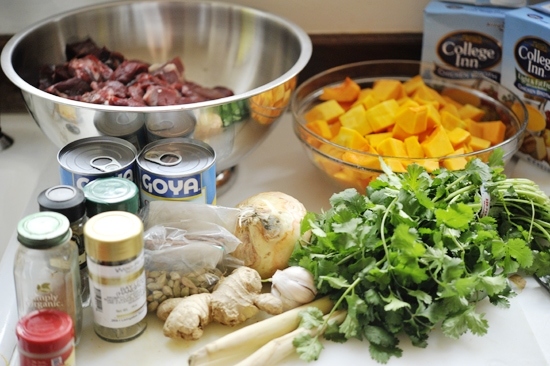 You will need: grape seed oil, venison, lemongrass, garlic, onion, bay leaves, cinnamon sticks, nutmeg, dried chili flakes, curry powder, coconut milk, chicken stock, butternut squash, and cilantro. Dice your ginger, onion, lemongrass and garlic. 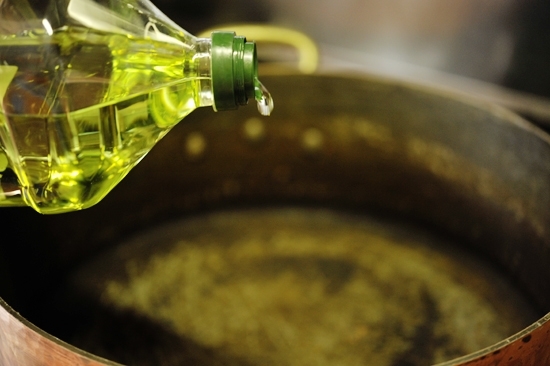 In a large heavy bottomed pot, heat the oil until it is nice and hot. You want the meat to brown well. 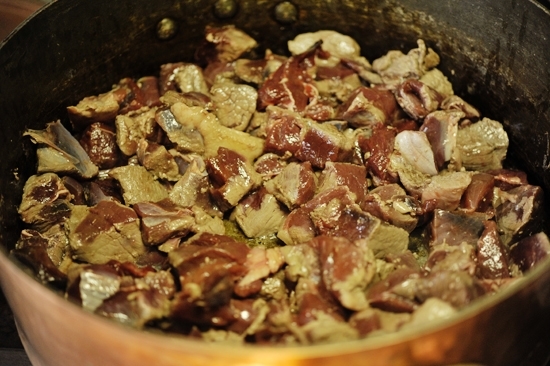 Season the venison cubes with salt and pepper and add them to the oil, browning them on all sides, about 5 minutes. 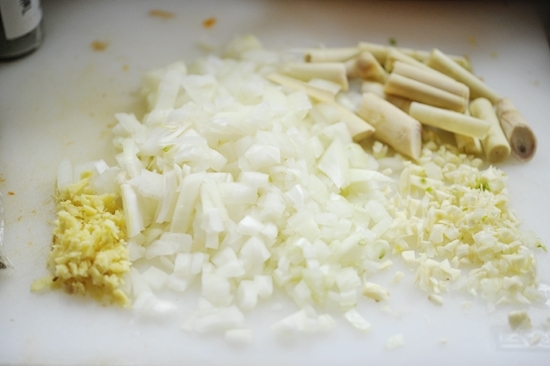 Add the lemongrass, garlic, onion and ginger and stir until it exudes its aroma, about 5 minutes. 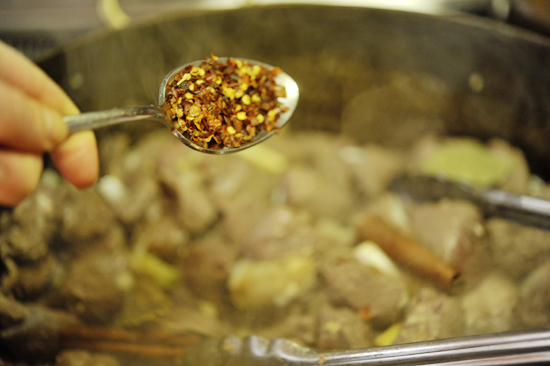 Add the bay leaves, cinnamon sticks, nutmeg, chili flakes, and curry and stir well. Your kitchen will start to smell amazing. …and chicken stock, and stir. Cover and let simmer for about 2 hours, until the venison becomes tender. After 2 hours, add the squash and cover. 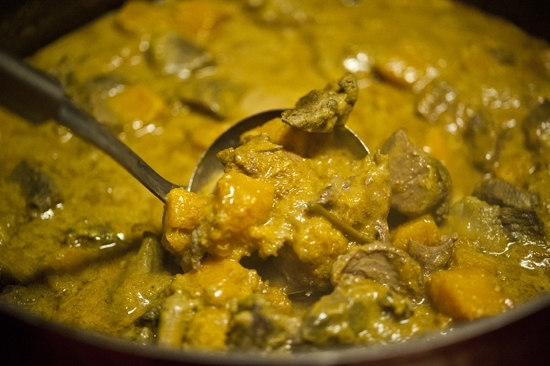 Let cook until the squash is tender and the venison cubes fall apart easily. Garnish with cilantro leaves and serve! You will love this. It’s great for these cold winter months. This recipe also works well with lamb, beef and bison. 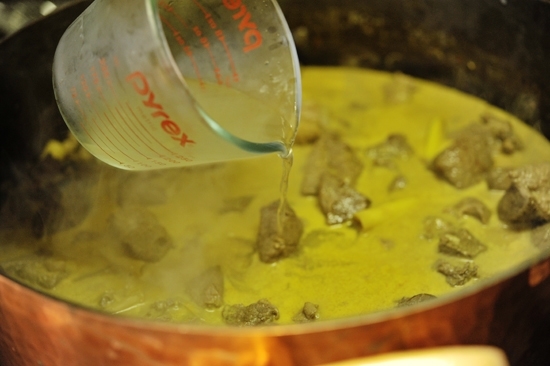 In a large heavy bottomed pot, heat the oil. Season the venison cubes with salt and pepper and add them to the oil, browning them on all sides, about 5 minutes. Add the bay leaves, cinnamon sticks, nutmeg, chili flakes, and curry and stir well. Pour in the coconut milk and chicken stock, and stir. 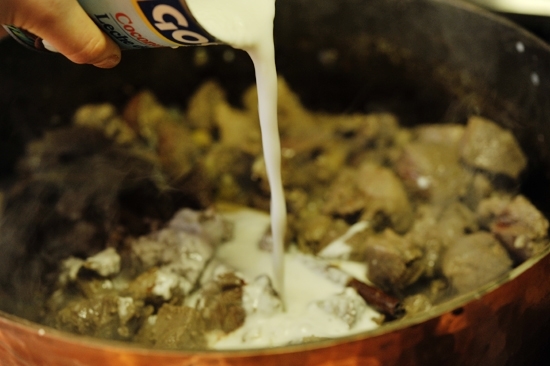 Cover and let simmer for about 2 hours, until the venison becomes tender. Garnish with cilantro leaves and serve. As a fellow girl-hunter and hungry person, I love interesting recipes for game!! After a freezer-full of game has been making its way to your table all year you hunger for something other than the standards. Usually I end up make-shifting other recipes to work. 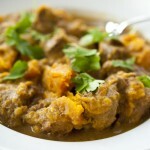 This is one of my favorite adaptations (I love Heidi’s website and recipes as well): A different kind of curry! Notice it doesn’t contain meat. Well, I love the warm spice combo here and the rich flavors all around, so I brown some stew meat up first (elk, deer, beef, whatev), then add onions, then spices, then the rest and simmer forever. Oh, and skip most of the water, depending on your tomato situation. 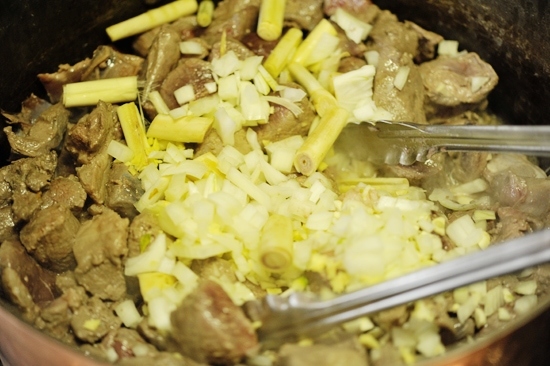 Now you have a DELICIOUS stew of unknown name and it eats very well over brown rice or potatoes. Add some kind of winter greens at the end for some roughage. Dollop with yogurt and cilantro. Always a crowd-pleaser, with or without the coconut milk. I’ve served it both ways. Try it, you won’t be disappointed! As a bowhunter, I cook a lot of venison, but I’v found that even when I pat it dry, it puts out a lot of liquid before getting browned on all sides. Any thoughts on how to alleviate this? I often make a similar dish, but it’s the quick stir-fry version: venison cutlets cut into strips and browned, add a jar of one of the many good Indian curry sauces now available at the grocery store and a bag or 2 of frozen broccoli/carrot/cauliflower mix. Almost no work, and delicious over rice and as leftovers. Hi Carole, the best way to get meat well browned is to get your pan smoking hot, and use grape seed or vegetable oil, not olive oil. You also want to make sure that you don’t use a non-stick pan as this doesn’t encourage brown bits to form, which you want. 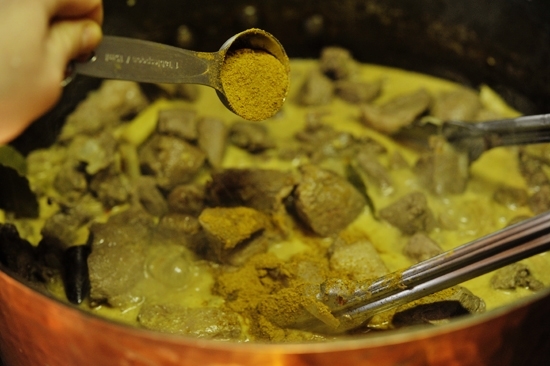 Also, make sure you brown in batches if you have a lot of meat, crowding the pot will create too much moisture. Happy cooking! 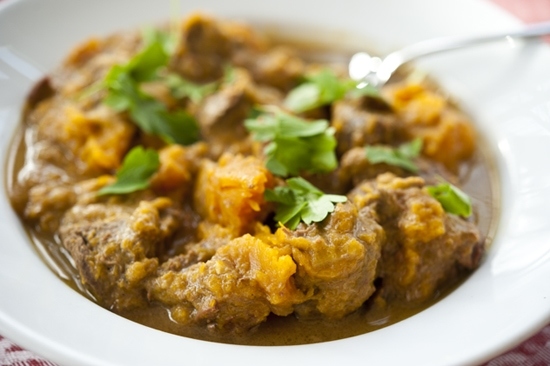 What a gorgeous curry and your Girl Hunter Weekend sounds amazing! This looks fabulous! I am curious about how you age the venison. My son just got one at the end of the season and we haven’t butchered it yet. Hi there! 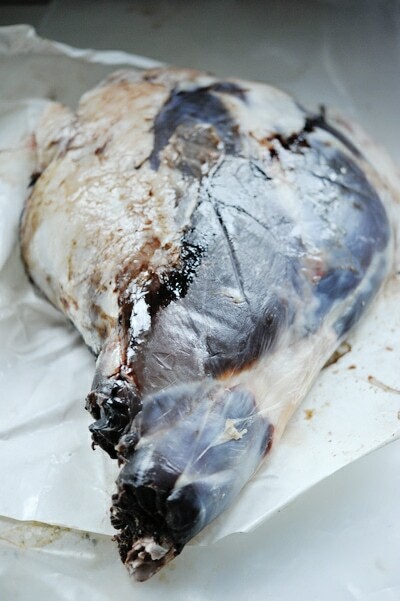 Here is a post I did on aging a looong time ago: http://georgiap.webfactional.com/2009/11/17/recipes/how-to-age-venison/. I also have more information on it in my book! Georgia, I made this tonight with a roast from my first doe gun kill. It was delicious even though I didn’t have lemongrass so I sub with some lemon juice. Some warm naan bread was perfect for soaking up the spicy sauce! Thanks for a great recipe! I made this yesterday, and it was tremendously good. I do have one question though. How would it effect things if the coconut milk was added later in the process? The coconut milk seemed to curdle (if that is even possible with coco milk). Perhaps I should have shaken it up more before adding? Anyway, thanks for the great recipe! Made this twice and stuck to the recipe because I am not familiar with cooking currys (although I wanted to do a few things different I stuck to my guns and followed you step by step). First time it was DELICIOUS ang got rave reviews (and sent my family & friends to your website). The only thing I did after it was made was because I thought it was missing the sweet factor I’ve tasted in some currys. I added red pepper jelly to my bowl and to the leftovers I had. My second attempt was not so successful-After browning it all tossed it in a crock pot on low but my cream broke. The flavors and taste was there but it just looked funny and because it was separated. Since we eat with our eyes first (especially children) my family couldn’t look past it and enjoy it again. Going forward it will always be made in the Dutch oven. Thank you for you recipes and inspiration!!! I’ve made this several times and we love it! We look forward to venison meat every year just because of this recipe. THanks so much. Made this last night in my dutch oven and today my taste buds are doing a happy dance! This is hands down the most flavorful curry I have ever made! The meat turned out tender and juicy. Made a few substitutions: I oNLY had 3lbs of venison so I added 1.5 cups of dry brown lentils in lieu of the last 2lbs, which helped absorb much of the excess liquid. Added 2tbsp brown sugar and an extra dash of cinnamon HALF way through the cooking time as I thought it was a little salty. I will definitely be making this again! Thank you for sharing the recipe! Thanks for a great recipe! I will Try. So much yum right now!! Sure glad I found this recipe! I only have a pound. I wouldn’t dream of cooking 5lbs of anything at one time. I’m going to attempt to drastically cut this down.